The end of the fiscal year marks a time of reflection and a chance for businesses to set forth tactics and goals to boost performance and profitability when leaping into the next fiscal year. As the end of the fiscal year approaches, businesses should determine what initiatives where successful, as well as what were financial weights in order to create strategic operational goals that will result in increased revenues and reduced costs in the next year. Richard Milam, office productivity expert and president and CEO of EnableSoft has over two decades of experience in business efficiency helping to develop productivity software. Executives should review the past year’s goals to discriminate which goals were reached and which were not reached. Uncovering the actions that were taken to reach the goals attained enables executives to create executable goals for the next year. In addition, although executives in the business make the decisions, it is the employees—the underdogs—who are out on the frontline, selling, interacting with customers, and creating the products that keep the business functioning. Executives must communicate with—and recognize—their employees in order to gain actionable feedback on the operations of the company. How did they interact with customers? What did they need to be more effective? Businesses must, one, discover what succeeded; two, discover what actions preceded those successes; and three, discover what employees need to improve their performance in the next year. 2. What Do You Stop Doing? While it is always favorable to consider what actions lead to profitable results, CEOs and CFOs may gain more useful knowledge by examining what actions or processes were not successful—or worse—financially damaging. There is a lot to gain from company-wide discovery sessions where employees and executives can discuss what processes or procedures were challenging or hindered profitability and collaborate on what can be done in the future to change the outcomes. Many times failed actions require just a tweak to become successful. Charrette (design and planning) sessions reveal the operations that actually occurred and the steps that resulted in unsuccessful outcomes. Employees will feel unified as they discuss strategies for improving processes and procedures, which allows executives to create modifications that may lead to future success. Setting next year’s goals is the easy part—increase profit margin, develop into new markets, cross-product sell, enhance product and service—but developing strategic, actionable plans is the nitty gritty part of goal setting. Now is the time to take what was learned from last year and use the knowledge to set goals for the new fiscal year. Generate each step, process, or action that executives and employees must execute in order to reach—or exceed—goals. Set bigger goals that will generate a larger income, but also ensure the goals set are reasonable and on target. If employee’s have the mentality that their goals are unattainable, they will not strive for excellence or become sloppy in executing their specific plan of actions. In addition, while large sales may be a “home run,” encourage smaller “base hit” sales, which can happen every day. Multiple small sales form the drivers of profitable revenue growth, plus, builds employees’ confidence so they are more prepared to take advantage of “home run” opportunities when they do come along. Building on successes, and learning from failures puts the company in a position of power. 4. Increase Efficiency While Reducing Costs. In today’s economy, the ultimate success of a company depends on their efficiency. Year after year, one recurring goal is to do more with fewer resources. Technology has provided great advancements over the current century and businesses are beginning to be more open to adopting new technologies in order to increase their productivity and efficiency. However, one large complexity organizations face in a world dictated by consumerization is the variety of user interfaces that must be supported by applications and programs of all types. Information technology and operations managers desire technologies that will fully integrate with their existing systems in order to increase productivity and efficiency—not create more work for them. In the recent years, organizations have leveraged what’s known as, Robotic Process Automation (RPA), a technology which creates a Return On Investment (ROI), immediately. IT folks love automation technologies, like Foxtrot, a RPA technology, created by EnableSoft, because it is easy to learn, but essentially, interfaces with existing applications to create an omnipresent environment. Operations staff love it because it gives them the ability to take action on their own without the need to involve outside resources. Upgrading several applications can be costly, but implementing one application that can be leveraged for many processes and works with current user applications and databases becomes very cost-effective. 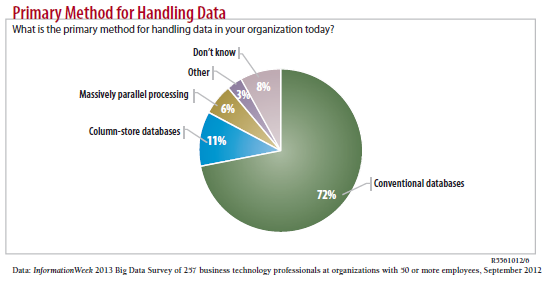 An InformationWeek Big Data Survey clearly shows how organizations are not quite organized when it comes to storing and processing their data. It becomes imperative for CTOs to implement technologies that will integrate their data systems and make managing—and analyzing—their data easy. One Foxtrot user, Barry Allen, Vice President, Credit Operations, at 2 Billion-asset Southern Bank, agrees, “I have had access to other tools in organizations, and I don’t know if there is another keystroke program out there that can do what Foxtrot does.” Robotic Process Automation can be utilized, quickly and easy, by end-users, and begin performing many of the manual data-related processes within the organization, thus creating a high ROI. Industries that have embraced Robotic Process Automation have found they have reduced their costs of hiring more staff, increased their efficiency and productivity, and even discovered new profits from processes that employees did not have time for previously. The end-of-fiscal year reflection for organizations provides valuable information that can be used to forecast new profitable projects and enable CEOs and CFOs to budget accordingly for the new year. Setting new fiscal year goals to increase productivity and efficiency, encourage and empower employees to be successful, and generate new and bigger revenue than last year puts businesses on a trajectory of growth and financial enhancement.